Malaysia Property News | Property Market In Malaysia: Temasek eyeing Lido developer? SINGAPORE'S Temasek Holdings is believed to be eyeing a stake in Central Malaysian Properties Sdn Bhd (CMP), the project developer of Lido Boulevard. 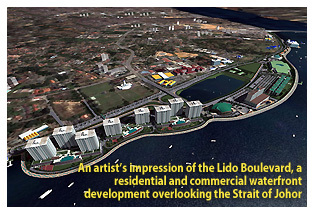 Lido Boulevard is a RM4 billion integrated residential and commercial waterfront development overlooking the Strait of Johor. It is understood that Temasek is in talks with majority shareholder Tan Sri Vincent Tan to take up a portion of his stake in the company. Questions emailed to both Tan and Temasek were not answered as at press time. The Crown Prince of Johor Tunku Ismail Ibrahim Sultan Ibrahim Iskandar is a 30 per cent share holder in CMP, while Tan owns a 47 per cent stake. Its other shareholders include Datin Leong Foong Lai with a 9 per cent stake and Pasti Ekslusif Sdn Bhd with a 14 per cent stake. Another source close to the deal said Temasek representatives had been to CMP offices for preliminary auditing. The Lido Boulevard project is a joint venture between CMP and State Secretary Inc.
"One of Temasek's issue is whether the project is indeed being developed. They want to make sure that it's not just another abandoned project in Johor Baru," one source said. Little has been heard of the project since late 2010, with many sure that it was a non-starter. In a recent interview, CMP's chief executive officer Khoo Boo Teng, however, said mitigation work on the project was to start this week and likely to go on for another three to four months. Reclamation work was expected to be completed in three years, Khoo said. According to accounts filed with the Companies Commission of Malaysia, CMP's reserves are running in the negative of RM25.5 million. Its assets stood at RM54.3 million, while liabilities were at RM79.56 million for the financial year ended December 2010. No accounts were filed thereafter. Should the Lido deal go through, it would be the second high-profile investment to have come into Johor Baru in recent months. November 2011 saw Billionaire Peter Lim team up with Tunku Ismail to start a joint-venture company to develop a S$2 billion (RM5 billion) 10ha medical complex close to the Johor Customs, Immigration and Quarantine Complex.